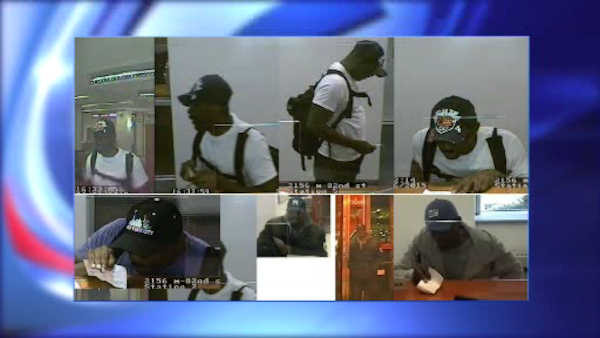 NEW YORK (WABC) -- Police are searching for the suspect in a spree of bank robberies in Manhattan. Detectives say he has stolen from $10,000 from eight banks since last September. The latest robbery was Friday afternoon at the Santander Bank on Broadway on the Upper West Side. In each case, the bandit handed a teller a note demanding money. The suspect is described as in his 40s, 5'9"and weighs approximately 170 pounds. He was last seen wearing a black baseball cap with "New York City" written on it, blue T-shirt, black du-rag, blue jeans and a black book bag.